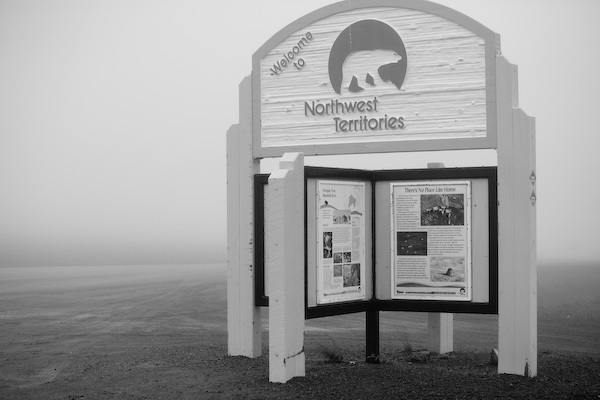 Today I made the long drive north on the Dempster Highway to Inuvik, once again crossing the Arctic Circle. Unfortunately the weather of yesterday continued and much of the journey was fraught with blanketing fog and drizzle. The road was muddy and slippery in certain sections, particularly where construction teams had been working, and I thought what a contrast this experience was becoming when compared with the conditions I had experienced on the Dalton. 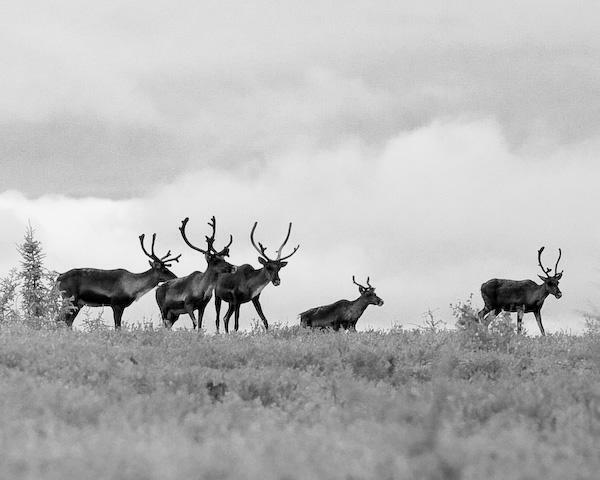 The redeeming feature of today was the sighting of numerous caribou framed by the gray skyline creating a mystical feeling in the dreary conditions. Originally I had planned to camp somewhere north of Eagle Plains, where I stopped for fuel, but with the weather looking unlikely to abate I pressed on to Inuvik, crossing into Northwest Territories and making two “on demand” ferry crossings, the first being at the Peel River, close to Fort McPherson and the second at the confluence of the Mackenzie/Arctic Red Rivers next to the town of Tsiigehtchic (“mouth of the iron river”), a Gwichʼin community. During the winter, these ferries are replaced by ice bridges and it reminds me how locals say driving the Dempster is often easier in winter because the ice packed road is more forgiving than the muddy or dusty summer conditions, all of course assuming you have the correct tires. Further more, in winter you can travel beyond Inuvik to the Arctic Ocean on the ice road across the delta. 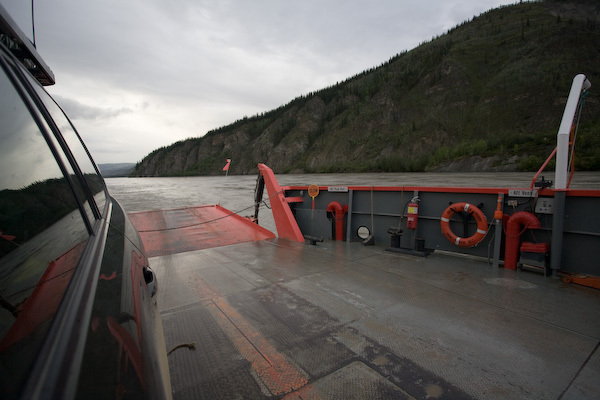 The first picture below is from the Peel River ferry crossing and the second is from the approach to the ferry at the Mackenzie/Arctic Red rivers confluence. 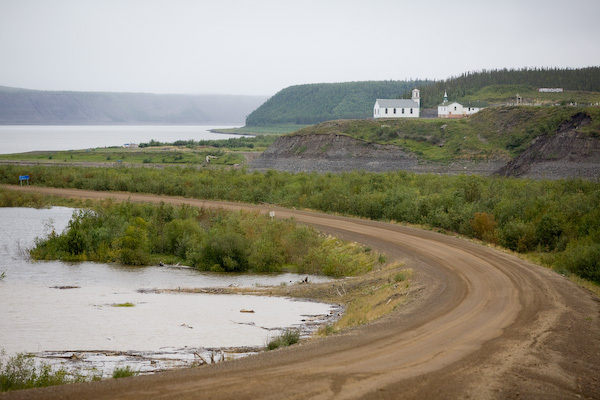 The white church is in Tsiigehtchic which lies between the two rivers just before they merge. Although I was well north of the Arctic Circle, it struck me how lush the vegetation was compared with the tundra at the same latitude on the Dalton. There were even trees! I later discovered that this is due to the Mackenzie river delta, the relatively warm waters of which keep the permafrost at bay allowing for more top soil in which life is able to flourish.